An Oreo Kiss, that is. So, if you have a chocolate lover on yourhands, then try these tasty treats and their hands might just be allover you. 1. Finely crush all but seven cookies in a food processor or place them in a ziploc bag and crush into a fine consistency. 3. Roll the mixture into 1〃 balls and place on wax paper covered cookie sheet. 5. Ithelps to put the uncoated balls in the freezer for a few minutes tokeep the mixture from starting to fall apart when you drop into themelted chocolate. 6. Melt chocolate as directed on package and thendip “kisses” one at a time into chocolate, tap off extra and slide themoff spoon onto wax paper covered cookie sheet to dry. 7. Once dry, refrigerate and enjoy! Oh yeah, just eat the extra seven cookies. 1. Handwrite your messages or create them on the computer. Cut out the strips (about 1/4〃 tall and however wide you need). 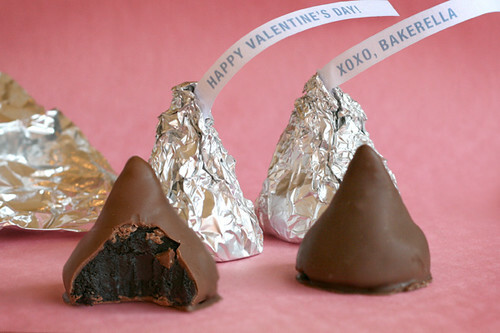 3.Place dry kiss in center and start wrapping the foil around the base.Insert message near top and secure it by pressing the foil together attop. GMT-8, 2019-4-25 06:11, Processed in 0.073767 second(s), 5 queries, Gzip enabled.